Models suggest that climate change in our region will involve an annual temperature increase of 3-4°F by the 2050’s, accompanied by changes in precipitation patterns, including drier summers despite a 5-15% increase in annual precipitation (Kruger et al. 2017). Even with this information, uncertainty still exists about what climate change will mean for agriculture, in general, and for dryland farming systems in our region, in particular. 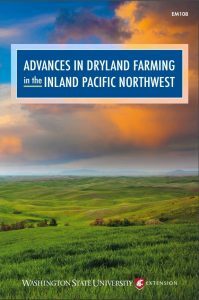 The book Advances in Dryland Farming in the Inland Pacific Northwest, does its part to help managers make decisions despite this uncertainty. Three chapters in this book explore management of diseases, insects, and weeds (the three major categories of pests) and were written by teams of authors led by Elizabeth Kirby (Washington State University), Sanford Eigenbrode (University of Idaho), and Ian Burke (Washington State University), respectively. Though these chapters provide a wide range of regionally-relevant information that goes far beyond climate, I found it particularly interesting to read through them with an eye to what farmers might expect in terms of changes in pest pressures as a result of projected changes in the climate. Through this process, I learned that although climate change models have improved vastly in recent years, quite a bit of uncertainty exists about the effects of climate change on complex biological systems. The main factors at play in terms of future changes and their impacts on agriculture are precipitation, temperature, and increased concentration of atmospheric CO2. These factors will affect crops as well as crop pests. While great differences exist between these categories of organisms, and between species within each category, there are some generalities that can be found. Some effects of climate change on pests are direct. For example, higher temperatures may lead to a shorter life cycle, and thus more generations per year, for some insect pests. Changes in temperature and precipitation will lead to a shift in the ranges of some pest species. In the case of weeds, the effects on weed-crop competition will make conditions more hospitable for weeds in some scenarios, and less hospitable in others. precipitation makes it less feasible to include spring crops in rotation, this will eliminate one of the tools that growers currently use to combat winter annual weeds. Another way that climate change can indirectly affect pest species is through its impact on organisms providing biological control to a pest species. 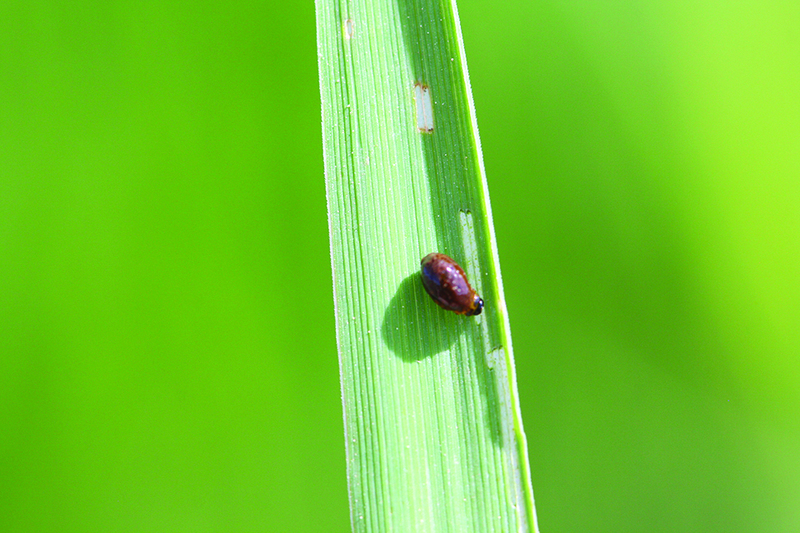 An example of an insect pest that expected to experience both direct and indirect effects is the cereal leaf beetle (Figure 1), which has been studied using bioclimatic models. 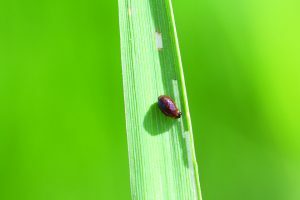 In general, the climate in the inland Pacific Northwest is expected to become more hospitable to cereal leaf beetle, a direct effect (Eigenbrode 2017). Simultaneously, the climate is expected to become less hospitable to the parasitic wasp that successfully provides biological control for the cereal leaf beetle (an indirect effect), which is expected to further increase the beetle’s population (Evans et al. 2012). Changes in climate are not expected to be uniform across the region. While it is possible to make general statements about projected climate trends, effects will be variable across the region. Agriculture involves complex systems with many interacting factors. These include climate, management, as well as the biotic and abiotic environment. Interactions between environmental and biotic factors are complex, making projections challenging (Juroszek and von Tiedemann 2013). There is simply a lack of studies on many of the agricultural pests in our region. For example, Eigenbrode and his co-authors say with regard to wireworms (Figure 2) that there are “no scientific studies or associated data that would suggest a correlation between wireworms and climate change, though we could speculate based on biology alone that number of generations per year, developmental time, life cycle, growth rate, or their known range may increase due to warmer overall temperatures in the inland PNW.” A similar lack of scientific studies exists for many other pest species. Different species within a pest group can be affected differently by climate change. Aphids, which have received extensive attention in terms of their response to climate change, offer one example. Data from 20-years of suction trap collections suggest that three aphid species responded differently to climatic factors. Russian wheat aphid, rose-grass aphid, and bird cherry-oat aphid, were positively correlated, negatively correlated, and unrelated to increases in temperature, respectively (Davis et al. 2014). Climate is not the only change affecting agricultural systems. According to Kirby and her co-authors, “adoption of new technologies and cropping practices may have a greater impact on wheat and barley diseases than climate change in the near future.” New cropping practices and other important changes driven by societal and economic factors may be more difficult to predict than environmental changes. For example, future market conditions may lead to the expansion of a new crop species in the region, dramatically changing relevant pest pressures. The constantly changing landscape of insect pests and diseases has always required farmers and researchers to adapt. It’s therefore likely that many of the same strategies currently used to combat these organisms will be useful to adapt to changes in pest pressures resulting from climate change. These strategies include improving genetic resistance, altering planting schedules, new chemistries, and biological control. Continued research in this area will provide both improved predictions and critical information for producers making decisions in the face of uncertainty. 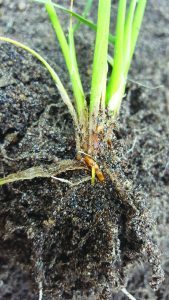 Learn more about recent research on weeds and insect pests of the inland Pacific Northwest cereal systems in the chapters on these topics in Advances. Or hear directly from the authors of the weed and insect chapters in the webinar, Integrated Weed Management and Insect Pests in Dryland Cereal Systems on Monday, December 18 8:00-9:00 am. Burke, I., K. Kahl, N. Tautges, and F. Young. 2017. Integrated Weed Management. in G. Yorgey and C. Kruger (Eds.) Advances in Dryland Farming in the Inland Pacific Northwest. (p. 353-398). Pullman WA: Washington State University Extension. Davis, T.S., J. Abatzoglou, N.A. Bosque-Pérez, S.E. Halbert, K. Pike, and S.D. Eigenbrode. 2014. Differing contributions of density dependence and climate to the population dynamics of three eruptive herbivores. Ecological Entomology. Eigenbrode, S., E. Bechinski, N. Bosque-Pérez, D. Crowder, A. Rashed, S. Rondon, and B. Stokes. 2017. Insect Management Strategies. in G. Yorgey and C. Kruger (Eds.) Advances in Dryland Farming in the Inland Pacific Northwest. (p. 469-536). Pullman WA: Washington State University Extension. Evans, E.W., N.R. Carlile, M.B. Innes, and N. Pitigala. 2012. Warm springs reduce parasitism of the cereal leaf beetle through phenological mismatch. Journal of Applied Entomology 137: 321–400. Juroszek, P., and A. von Tiedemann. 2013. Plant pathogens, insect pests and weeds in a changing global climate: A review of approaches, challenges, research gaps, key studies and concepts. Journal of Agricultural Science 151: 163-188. Kirby, E., T. Paulitz, T. Murray, K. Schroeder, and X. Chen. 2017. Disease Management for Wheat and Barley. in G. Yorgey and C. Kruger (Eds.) Advances in Dryland Farming in the Inland Pacific Northwest. (p. 399-468). Pullman WA: Washington State University Extension. Kruger, C., E. Allen, J. Abatzoglou, K. Rajagopalan, and E. Kirby. 2017. Climate Considerations in G. Yorgey and C. Kruger (Eds.) Advances in Dryland Farming in the Inland Pacific Northwest. (p. 15-46). Pullman WA: Washington State University Extension. 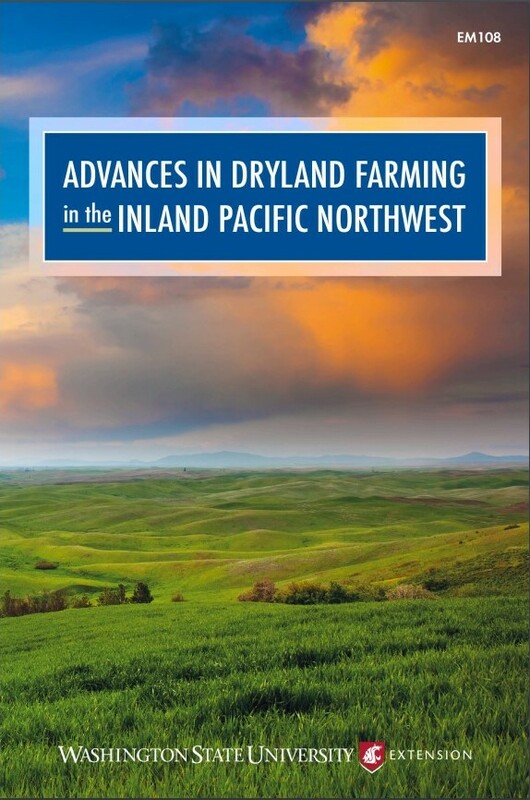 A full set of references for the information presented is available in the above chapters in Advances in Dryland Farming in the Inland Pacific Northwest.